Will Ferrell stars as Ron Burgundy, the top-rated anchorman in San Diego in the '70s. When feminism marches into the newsroom in the form of ambitious newswoman Veronica Corningstone, Ron is willing to play along at first-as long as Veronica stays in her place, covering cat fashion shows, cooking, and other ''female'' interests. But when Veronica refuses to settle for being eye candy and steps behind the news desk, it's more than a battle between two perfectly coiffed anchor-persons...it's war. 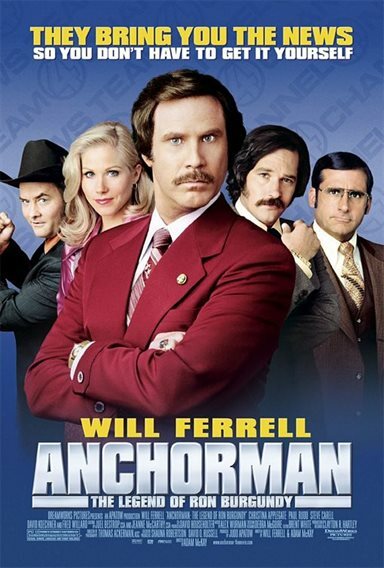 Download Anchorman: The Legend of Ron Burgundy in Digital HD from the iTunes store. Anchorman: The Legend of Ron Burgundy images are © DreamWorks Studios. All Rights Reserved.